In freely moving vertebrates, different regions of the central and peripheral nervous systems interact to elicit coordinated physiological responses to environmental and behavioural changes. In this context, coordination and coupling between locomotor and respiratory movements have been described in various mammalian species during locomotion. Using a completely isolated in vitro preparation of a neonate mammalian nervous system, we have previously reported that lumbar locomotor generators exert an excitatory remote control of brainstem respiratory network (Le Gal et al. (2014) PLoS ONE) and may take an active part in the increased respiratory rhythmicity produced at the onset and during locomotion. 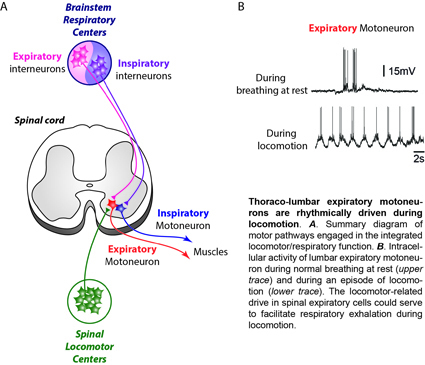 In this recent publication, we further explore neurogenic mechanisms engaged in the coordination between these two vital functions and we show that lumbar locomotor generators can directly modulate the activity of spinal respiratory neurons. We therefore report for the first time in the neonatal rat spinal cord the existence of thoraco-lumbar motoneurons and interneurons displaying both expiratory- and locomotor-related drive. In this way, these bimodal spinal neurons, which are involved in expiration during breathing at rest, could help respiratory exhalation during episodes of locomotion.